Shattenkirk the Solution to Caps' Playoff Woes? Shattenkirk the Solution to Caps’ Playoff Woes? The Washington Capitals may have made just one deal, but their acquisition of defenseman Kevin Shattenkirk made them the winners of the 2017 NHL Trade Deadline. Shattenkirk was pretty much the only top-pairing right-handed defenseman available this deadline, and by locking him up as a rental, Washington ensured that they are making a serious run at the Stanley Cup this season. The true question, however, lies in whether or not he is the answer to the team’s playoff woes. 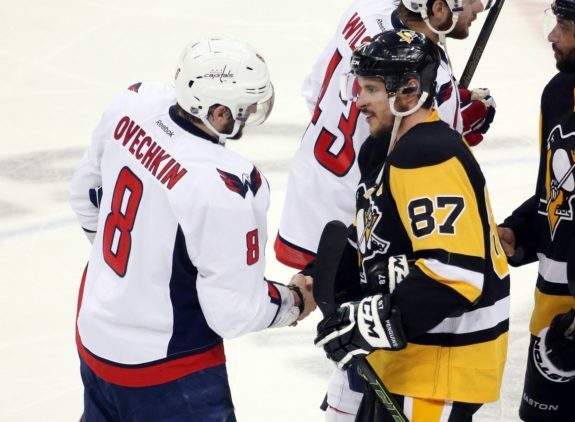 It seems that as each season passes, the Capitals find themselves stifled when it comes to moving beyond the second round of the Stanley Cup playoffs. They go into each postseason with a head full of steam and eyes full of hope, but they start to fall apart. For example, their offense comes up short, and defensively, they panic, which leads to them eventually collapsing and giving up critical goals. In addition, during playoff time, Washington doesn’t always appear to ooze the confidence and bravado they usually do, and can’t find it in themselves to take over control of the game. Though the team works as a collective unit, the Capitals have struggled to find the final piece to the puzzle. To make a team cohesive, all aspects of it have to be working; over the offseason, Washington chose to fix their bottom-six, which in turn strengthened and added depth to the forward lines. Though the defense is excellent, Washington seemed to lack something: besides John Carlson, the team lacked a puck-moving, high-scoring right-handed defenseman. With Shattenkirk, Washington finally has an asset that can not only bring strength to the right side of the defense corps but can help continue their offensive dominance while protecting the blue line. While Brooks Orpik is a solid stay-at-home defenseman, he has never had the perfect defensive partner. He would play with players who either played too similar a style to be effective or were playing left-handed. Now, with Shattenkirk, it seems as if Orpik has finally found his match. Both of these players have such different styles of play, that in the end, each of them possesses characteristics that the other lacks. MacLellan said Oshie and Orpik gave Shattenkirk a "glowing recommendation"
Since joining the Capitals, Shattenkirk has worked on the bottom pairing with Orpik, and the two appear to bounce off each other, making up for each other’s shortcomings in their game. This will make them one of the strongest combinations in the NHL and eventually lead them far in the playoffs. It’s no secret that Shattenkirk is an offensive defenseman first and that he is not afraid to make high-quality first passes or jump up in the rush. He is a player who steps up offensively and can even contribute on special teams. He possesses playmaking ability and has 11 goals and 42 points on the season. Not only that, but he is a player who shoots the puck often and can compare to the likes of former Capitals blueliner Mike Green. Orpik, however, is the complete opposite. He has a stay-at-home mentality that shows in his increased physicality. He has 142 hits and 90 shot blocks, along with 12 assists through 60 games this season. Orpik is a smart, veteran player who uses his 6-foot-3, 219-pound frame to his advantage, and he knows how to protect the puck and defend effectively. With this powerful duo filling out the bottom pairing, the Capitals finally find themselves with a stacked and well-off defense. Washington already has one of the most lethal offensive arsenals in the NHL. Behind Alex Ovechkin, Nicklas Backstrom, Evgeny Kuznetsov, T.J. Oshie and Marcus Johansson all step up and provide excellent numbers on the forward lines. With Shattenkirk joining the defense corps, he can provide his passing and playmaking ability on the fly and also be an asset on the power play. If he continues to keep up the consistent, impressive numbers he’s shown over his career, the Capitals will not have any problems scoring, nor will they have to worry about a lack of success on the man-advantage. If Shattenkirk can provide more offensive acumen, the Capitals will be ready to make a deep run for the Stanley Cup. The New York native has put up at least 40 points in his last five seasons and is one of the best puck-movers in the league. Right-handed shots that can provide an offensive-defense style are a rarity in the NHL, and in order for a team to truly be successful, they need to have a top blueliner like that in the lineup. Shattenkirk, knowing how to take plenty of shots, make clever passes and skate well, will surely bring top offense to this team. While Shattenkirk does an excellent job offensively, he is also solid on the back-end. The two-time All-Star takes great care of the puck and displays outstanding control on the ice. He is calm and collected and makes his job look easy. Not to mention, Shattenkirk rarely gives away the puck and can win battles in the corner, as well as keep up with a play and be completely aware of where he needs to be. His on-ice intelligence is unprecedented and will truly help Washington, who needed an upgrade from the services of Nate Schmidt and Taylor Chorney, both of whom are left-handed. Without a doubt, this was likely one of, if not the biggest, transactions at the 2017 trade deadline. Shattenkirk will help the Capitals in a wide variety of areas, and though he could end up being only a rental, considering he is a UFA at the end of this year, he is more than that. Shattenkirk is a statement, one that declares that this team is ready to make a run for its first Cup.